Recently bluer (my church) just finished a series of messages exploring “An Emerging God.” It was an attempt to remind ourselves that God is everywhere, and in everything, we just need eyes to see him… ears to hear him… and hearts to feel him. I spent the day gardening with my mom. We planted her two flowers gardens, some climbing flowers in the front, and some tomato plants on the deck. Check out the pictures. I carefully prepared the holes for the plants, removing weeds and stones. Then I removed the flowers from their flimsy plastic pots- being sure to loosen them first, then unbound the roots so they would spread and grow. Then I would fill in the dirt around the roots and smooth it all out. Then I sat back and looked at my work, and imagined what the plant would look like as it grew and flourished. And then it hit me… this is what God did with my life. At one time, I thought I had it all figured out. There was no God, we were all a cosmic coincidence, and my home theater system was something worth large amounts of time and money. I was not a cosmic accident, I was a beloved son and my home theater system was a minor, minor detail. Carefully and lovingly, God loosened me up, removed me from my pot, unbound my roots and planted me in His Garden… so I could grow and flourish. Of course it was a messy process (that continues to this day) but you can’t plant flowers without getting your hands dirty… and in the end… it’s worth it. 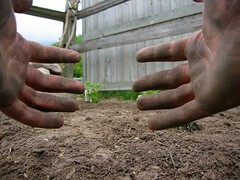 Mom, if you ever read this: thanks for reminding me who the real master gardener is. Luv ya. The deer didn’t make it. My car made it to the next exit, then I didn’t dare drive it more. The radiator is cracked and leaking a bit. 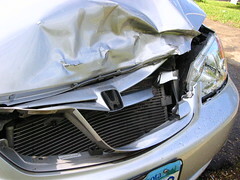 A local body shop will look at it on Tuesday. My insurance will cover it 100%, which is a relief. My parents came and picked me up so I got to Portage safe. I’m OK. I suspect I’ll be a little sore, but I’m just thankful to be alive and uninjured. On Tuesday I’ll talk to the shop and decide whether to drive back to Minneapolis (in a borrowed car) or stick around in Portage until it’s fixed. I found myself wondering if I had left 15 minutes earlier or later if this would have happened, or if that deer was somehow meant for me… I don’t know. I’m thankful to God for keeping me safe, but a bit confounded by his purpose for all this. I’m at Richfield Honda getting an oil change at the moment. Although they don’t appear to have WiFi (not sure as my laptop is at home) they do have 2 computer workstations with internet access for customer use. Why they are using IE and not Firefox is beyond me, but hey, it’s pretty great to not be stuck watching bad TV like I was at Hopkins Honda! Perhaps, but it makes me smile. You are currently browsing the the stuff in my head blog archives for May, 2005.